Please view below our FAQ (frequently asked questions) to help you with any queries that you may have. Just click on any question and the answer will be displayed. Should you have a particular question that has not been answered then please view our contact us page. Pam or Tony are only too happy to assist you in any way that they can. Whatever the question, please ask and we will do our very best to accommodate you. Do you have High Speed Wireless Internet? Yes, High Speed Wireless Internet Access is available free of charge to all Guests. Bring your own Laptop, Notebook, Netbook, iPad or Smartphone and simply connect. Use the Guest Lounge or the large deck (with simply the best views over the Gold Coast) or connect from your room. How warm / cold does it get on Mt Tamborine? What size beds are in the Guest Rooms? What facilities are provided in the Guest Rooms? All our Guest Rooms are en-suited with Reverse Cycle air-conditioning, TV with DVD (some movies are available), some reading matter, Coffee/ Tea making Facilities, Bar Fridge, a small Table with 2 chairs. All rooms have opening windows which overlook the beautiful gardens. What to wear whilst visiting Mount Tamborine? Whilst it can get warm in the daytime during the summer months on Tamborine Mountain (Dec, Jan & Feb), the evenings can sometimes be cool so it is always wise to bring along a warm jumper or coat just in case. Of course during the winter months (Jun, Jul & Aug), 'mountain weather' dictates that you bring warm clothing. Do your Guest rooms have a view? Each room shares a deck which has a coastal vista over the garden. Both the Lorikeet and Rosella Suites have a view from the eastern window. How far is Gallery Walk from our B&B accommodation? Very close. Approximately, a 15 min. walk or a few minutes drive away. How often does it rain on Tamborine Mountain? Can Guests use the main deck with simply the best views? Absolutely! The main deck is for our Guests to sit & relax and enjoy the superb views. Breakfast is usually served here as well. Sorry, but our accommodation is not suitable for children under the age of thirteen (this includes infants). Sorry no, we are an environmentally friendly Bed and Breakfast and feel spas do not fit that criteria on Tamborine Mountain. Please view our Environmental Policy Page. Where are the nearest Waterfalls? Curtis Falls at Joalah National Park is within a 5 minute drive. There are a number of National Parks with waterfalls on the Mountain. We can supply you with a Map of all the walking tracks on Mt Tamborine and offer any advice and tips when you arrive. How far away are the Theme Parks such as Movie World and Dream World? Both are within a 35 minute drive. 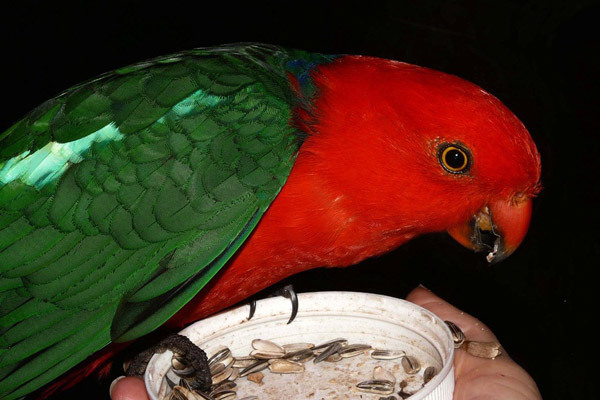 Where will we see native birds and animals? You will see birds at our B&B and Palm Grove National Park has Pademelons / Wallabies if you visit early morning or late afternoon. The local wildlife is very rich and diverse so you never know what you will see as you move around the mountain. Are there any National Parks within walking distance? Yes! Both Palm Grove and MacDonald National Parks are just a short walk from the B&B. Where can we buy a drink? You can either choose from our in-house Beverage Menu or visit the local bottle shop. The Wineries are all within a 10 min. drive and there are also 2 Boutique Breweries on Gallery Walk less than a 5 minute drive away. Yes and most restaurants are within 5 minutes drive of the B&B. Please check with us if you would like further information on the many restaurants on Tamborine Mountain. Can we order a ‘Take Away’ meal from one of the restaurants or a Cheese Platter from you and enjoy it on the deck? Yes! We are also happy to provide Cutlery & Crockery as well. Do you cater for Evening Meals? Yes, but for Group Bookings only. Using all 4 rooms and a minimum two night, weekend stay. The first nights accommodation will be charged at the time of booking. The balance of the booking will be charged on arrival. Any deposit paid is non-refundable. 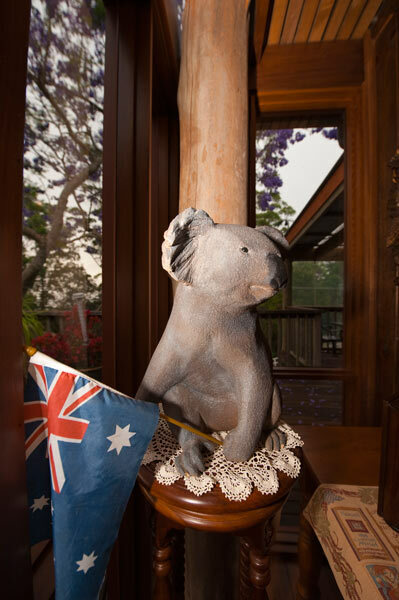 Failure to arrive at Tamborine Mountain Bed & Breakfast will be treated as a no-show and no refund will be given. Please note that we accept both Mastercard and Visa credit cards. We do NOT accept Diners Club or American Express. Children under 13 cannot be accommodated at the hotel (this includes infants). Smoking is not permitted within the B&B buildings. Outside areas are provided. Please consider other non-smoking guests. No candles in the rooms.